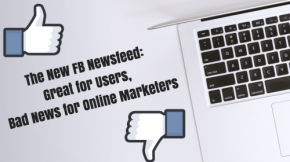 By now you are likely aware of the latest BIG change taking place in the Facebook newsfeed. The social network is going back to its roots of focusing more on posts published by friends and family, and less on posts published by brand pages. This is all in an effort to make the Facebook experience more meaningful for users. One of the most common questions people have asked me about Twitter (besides of course “why do I care what you’re doing?”) is how on earth I follow so many people. The question is a valid one since at a following count of over 4,000 people and counting, it is not humanly possible to read every tweet, every thought, or every link that those people share. The basic premise of following people on Twitter is that you are at least somewhat interested in what they have to say, so the question of how I follow them all is a good one. While the buzz surrounding social media is growing, so is the number of people who just don’t get it. In fact, I come across tens of people daily that use Twitter and have a significant following but are totally clueless about maximizing it. They make mistake after mistake and see none of the results social media can bring. Let me emphasize that there is no one way to use social media “properly”, everyone uses it differently, that is part of the very essence of social tools. However, if these people are annoying their audience with spam-like tweets and causing people to unfollow, it is safe to say they are doing it “wrong”. Ever since Web 2.0 was introduced, or at least since “social” became the big buzz word, everyone talks about the three big social networks: Facebook, Twitter, and LinkedIn (then there is the occasional MySpace fan, I never even made an account). Now, I always enjoyed myself a little Facebook, but was never a huge believer in its value as a business networking tool. I am pretty sure you know my stance on Twitter and its ability to help you achieve your goals, no matter what they might be. However, for the longest time, I did not get LinkedIn. I found its interface to be annoying and not user-friendly. I never really got any added value out of my LinkedIn network. To me, it was just another network I was on, that would send me annoying emails once a day. Twitter has taken off since my last post. It is all over the place. You can turn on the TV at any given time in any given country and be sure to hear it mentioned. Between Oprah, Ellen, Ashton, and many others, it is safe to say, Twitter is becoming much more mainstream as time goes on. I already wrote a list of reasons explaining why you should tweet, how to tweet, and what to do after you join Twitter, I thought I would tell you what NOT to do when tweeting. After a long three months of job searching using every available tool, looks like I have landed myself a position as a Content Manager at a Forex startup. At the risk of giving myself a huge jinx before I even start the job, I wanted to share with you my experience over the last three months, and how I reached the indisputable conclusion that social media is the way to go. Over this extremely trying period of looking for my next job, I used pretty much every tool available to me. That includes the traditional job websites, as well as outsourcing companies, and placement agencies. I must have sent out a 100 CVs a week, each with a really impressive cover letter as well as a CV customized for the type of position for which I am applying. I will not say that was a total failure. I did get a handful of interviews from them, but nothing came of any of them. What seems to count more than a nice cover letter or CV is people’s opinion and recommendation of you as an individual. In addition to those tools, I used Facebook, Twitter, LinkedIn, emails to all my contacts as well as community lists, and let’s not forget a whole lot of IMing. So in the hope that one or more of my readers will benefit from this information, I decided to share with you some of the tools that I found to be useful. Let’s start with the one that ended up closing the deal, Facebook (with a little IM help on the side). I know people today seem to think of Facebook as a waste of time and one of those things “I just do not need”, but my experience proved otherwise. Yes, it is true, Facebook can be a huge distraction and occupy a lot of your time, but the exposure that one can get using Facebook is unprecedented. At a simple click of a button, you can let hundreds if not thousands of people know you are looking for a job, and that is what I did. What ended up happening with me is that, the fact that I was looking became known to pretty much everyone I ever knew, and an old friend of mine, who, the truth be told, would probably have found out via IM anyway, heard I was unemployed. Now, remember, I was working in the technology and cellular industry in my last job. This particular friend works in the Forex industry, and has built various sites, one of them being a Digg style website for Forex news , as well as others for the Forex community. Well, he made a connection through one of his sites with an individual who has recently started a company and was looking for a content manager. He then made the match. This story could never have happened five years ago, when there was no social media and all these tools were unavailable to us. Now, it is important to emphasize that this particular opportunity worked out for the best, but for every interview I got through the job sites, I got five from networking. Wherever I was, whoever I was talking to, I put aside the embarrassment of being laid off from my last company (although, in today’s economy, it is not so bad, who doesn’t know someone that lost their job recently? Check out this list. ), and pretty much let anyone and everyone know I am looking. Just to sum up, if you or someone you know are looking for a job in almost any field, I would recommend making use of the old fashion tools as well, but spending much more time developing your profile and networks on the various social media tools. If you want to know more details about the exact manner in which I did this networking, or alternatively, if you want more information on the traditional side of things, the sites I used etc., you can message me on Facebook here, DM on Twitter here, write me on LinkedIn here, email me here. Or, you can also call me if you have my number, I have not stopped using that means of communication, YET. Who Needs Firefox/Safari When You Have Digsby? As we wait for any big news from CES, and grieve about the almost total lack of any news at all from Macworld, I thought I would tell you about a desktop application that is up there with the best I have ever used. It it not new, but its latest updates make it a real show-stopper. I am talking about the IM, Social Networking, and email aggregator for PC, Mac, or Linux; Digsby. OK, enough lists. Bottom line is, Digsby pretty much offers you every possible tool used to communicate on the Web (I guess Skype is missing, but then again, with so many VOIP options in the above lists, why use Skype?). In addition to all the available services, the actual experience is absolutely perfect. Tabbed conversations, awesome skins, nicknames, reply from within popup notifications, Facebook and Twitter updates that do not disturb your work, and more and more. I can go on and on with Digsby’s amazing features, but I am sure you get the point. Just to summarize, ever since I installed the latest update, I have not opened up a browser more than twice, and that was to check the news. So, why is it not the perfect program? Well, if I have to name something, it does not include CNN updates, yet! Why is Everyone Crying Over the New Facebook? Over the past few months Facebook has been testing its new interface. Frankly, I was quite excited to try it out. In the beginning there were a few bugs and glitches, but they have ironed most of them out by now. I think the new design is spaced well and is easy to navigate. The photos are much easier to access now and you don’t have all those crazy wall programs on the main page. But there have been groups started on Facebook with around 2 million people, to keep the old layout, not to mention the many mindless status updates: “I hate the new Facebook”, “what the hell happend to my Facebook”, “how do I get the old Facebook back”. What is everyone crying about? I like it.